The prime tourist destination of the Gulf Coast with the beaches of Ko Samui, the full moon parties at Ko Pha Ngan, diving at Ko Tao, the natural splendor of the Ang Thong Marine Park and untouched coast and beaches of Pathiu in Chumphon. Some destinations include Khao Lak, Similan Islands, Surin Islands, the southern Ko Chang, and Ranong for its quick visa-runs to Myanmar. The original Thai paradise island, now very developed but still with a lot of beautiful beaches. Also includes the wonderful limestone rock formations of the Phang Nga Bay. Beautiful beaches and nature, popular among Malaysian tourists. Due to separatist struggles, the three deep southern provinces might be better avoided. There are international airports in Phuket, Krabi, Hat Yai and on the island Ko Samui, although you are more likely to reach the region by flying to Bangkok and taking a connecting flight. It is now possible to travel by ferries in hi season (Nov-May) from Phuket and island hop your way down the coast all the way to Malaysia Indonesia. ko Lipe-Koh lipe being the hub on the border between Thailand and Malaysia having a Thai immigration office. 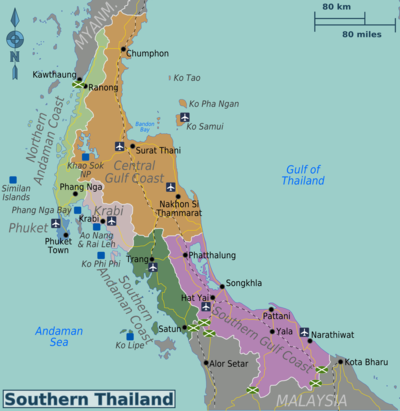 Thai portion could be done in a day, although chances are you'd want to stop on some of the islands. The region's major cities are served by frequent long distance buses run by both the government and tour operators. Trains from the north pass through the region en-route to Malaysia. The reefs around Ko Lipe are largely intact; they have been protected by being within Thailand's oldest National Marine Parks. The islands in the southern Gulf of Thailand including the Ang Thong National Marine Park which provides a beautiful sailing ground. Island hopping is great way to explore from the gateway of Chumphon to Koh Tao, Koh Phangan, Koh Samui. High speed catamaran and ferries leave the Chumphon ports throughout the day. On the west coast you also will be able to find many beautiful sailing areas, like Phang Nga Bay, Similan islands, Phi Phi islands,... Some charter companies offering day trips and overnight tours from Phuket to Phang Nga and other islands around Phuket. There are hundreds of islands just at Phang Nga Bay and you will need more then just a day trip to explore them all. A great way to explore this sailing ground is to charter a sailing boat for several weeks. Perhaps unsurprisingly for a coastal region, seafood features prominently on the menu. Traditional southern Thai food includes milder coconut-milk based curries popularly associated with Thailand: the dry, Malaysian-influenced Panaeng curry and Indian-influenced Massaman (Muslim) curry with potatoes and nuts. This page was last edited on 30 August 2018, at 12:10.